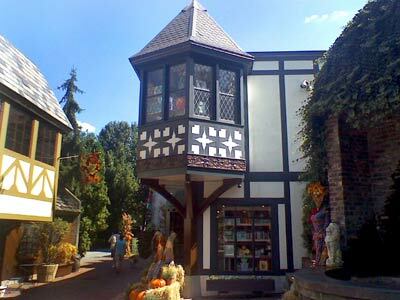 As I walk through The Village Shops in Gatlinburg Tn, I get a feeling of being in an Old English Village. From the building design structure down to the bricks on the walkways, the only modern twist is the ATM machine you see in the corner. You need an ATM in a Gatlinburg shopping location! 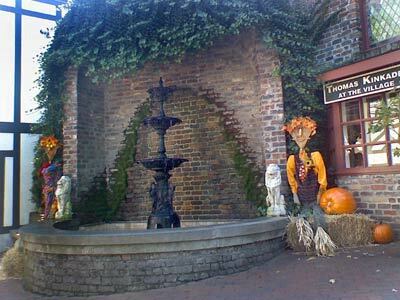 This time of year The Village is decorated for Fall. 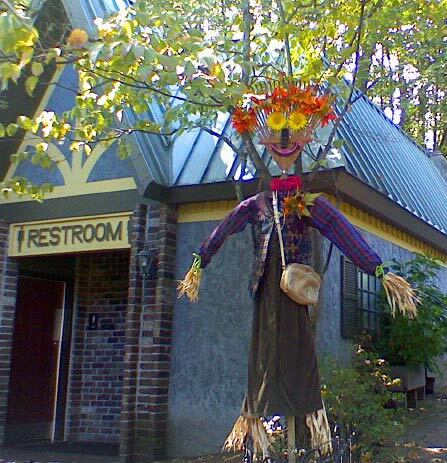 There are scarecrows with funny faces made from rakes and other various gardening tools. You can see haystacks with pumpkins on every corner which promote a joyous and cozy feeling. The first stop was Celtic Heritage they have items from Scotland and Ireland and the most beautiful jewelry. Next, as I walked past a shop called Verbena’s Body, Bath and Home. I was drawn into the store from the wonderful aroma coming out of its doors. The Candle Cottage had the most unique collection of scented candles they smelled so good as well. I started to get a little thirsty so I decided to venture into Jordan’s Village Creamery Coffee and drinks. I ordered a lemonade slushy, and it was so thirst quenching. That drink was just what I needed. The weather in Gatlinburg was a very nice, so I sat next to a relaxing water fountain and just people watched for a bit. The only downfall of the Village was the restrooms. The Village public restrooms are not the place to go. It’s not that they are dirty. They were actually very clean they are just tiny. When I say tiny, I mean the stalls are about 2 and a half feet wide by 3 maybe 4 feet long. I am a rather small person and I felt very closed in. I would not recommend using them if you are a little above petit in size or are claustrophobic. 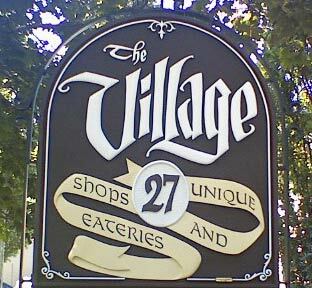 Other than the restrooms The Village is a must see if you are in Gatlinburg Tennessee. It’s a unique shopping village and has a relaxing and peaceful atmosphere. I have a few minutes until my meeting, so I'm stopping off of the spur between Gatlinburg and Pigeon Forge to catch some scenery and slow down my pace for the day. I'm always in a hurry and hustle and bustle, so this will be a welcomed break of the pace. I’m just about half way between Gatlinburg and Pigeon Forge, and I am pulled over into a very small parking area. I guess you could call it parking for four. Looks like only four cars can park here at a time. It’s been about 3 years since I have taken some time to see the little pigeon river up close. The last I touched it was when I first moved to Tennessee. My friends took me on a tour to Cades Cove, and this river was our first stop. What would be good right now are some yummy cherries. I could just sit here and watch the little pigeon river flow. I wonder if I could find some gold in there. The water is only about six inches deep at this part of the river and constantly flowing. I say six inches but I'm sure it changes on a monthly basis depending on the rain. The river is flowing from Gatlinburg into Pigeon Forge. One of these days maybe I can find the source. Is finding the beginning of the water flow like finding the pot of gold at the end of the rainbow? mmm the smell of fresh mountain grass. What? Grass? I love going off on tangents don’t you? What about the first date idea?!? It’s coming! Yep, looks like today is the day for the city of Pigeon Forge to mow the grass or maybe the Smoky Mountains Park is responsible. Who knows, I’m not going to ask the guy while he’s on that bushwhacker. After all of that soul searching on the river, my lawn mowing answer was just given to me. There is now a truck here that has the Great Smoky Mountains logo on the side, so the Great Smoky Mountain National Park does take care of this area, along with the U.S. Government department of the interior, national park service. ok enough about mowing. There is a big flat rock along the side of the river. I wonder what people would think of me if I just laid down a blanket and took a short power nap. Oh! I have a great Idea for a first date. Ok this is my idea for a first date or a couple just wanting to spend time with each other. I am probably in one of the most scenic spots for a picnic in the smoky mountains. There are relaxing sounds from the river and 360 degrees of nature, with just a few block to civilization. First, you would have to tell your date that what you're going to do requires them to take off their shoes. They have to be semi spontaneous. If not just leave them at the house. hehe Just tell your date you’re going to have a picnic. Once they get to the river they will have to be a little adventurous and cross in their bare feet. It’s not a big deal. It will be fun. Bring a picnic basket, cross the river (its less than ankle deep) and lay out a blanket over the rock. It’s a flat white rock just along side the river and is the perfect size for two and a picnic basket. I have made a home video of the rock (I really need to get a video camera. This video was taken with a cell phone) The first part of the video is me going down the side of the river. It’s not steep. Once you get to the other side, sit and enjoy your food, the surroundings, the peaceful flowing of the river and of course your lucky date, in the Smoky Mountains. Oh, once the second date comes around, a picture perfect Mountain View cabin is the answer. Need a cabin? Here are a few Gatlinburg or Pigeon Forge Cabins I have some great reconditions of cabins with views. Shoot me a message and Ill point out a few. Questions, Comments, or Drop Slips? Post a message here and I'll reply. Thank you so much for the recommendations. I did visit the Bear Camp Grill on Friday afternoon after coming back from a cabin company in Wears Valley. Bear Camp Grill’s prices aren’t low but their not outrageous either. I was in the mood for a burger, but I really didn’t want to pay the $7.75 plus for a burger and $1.89 for a coke. I was already there and didn’t want to venture to a different restaurant in Wears Valley. Like I said before there are not many restaurants to choose from. I did end up getting a cheese burger, and I must admit that I did get my moneys worth. The burger was huge 8ozs, and it was cooked to my liking (medium). The bun was fresh and it was a quality bun. Usually I’d pay for a burger at a fancy restaurant and all I taste is bun. I usually have to carve out the bun to take away the thickness. Everything was quality about this meal, including the leaf lettuce and tomato. I didn’t get any of that shredded stuff or a grotesque looking tomato. I had one issue; the plastic mustard bottle was crusted with old mustard. That was kind of gross, but I ended up using it anyway. I’m still alive and well, so no poisoning there. I also think they make home made fries. I can’t be too sure of that. The fries were like a steak fry but a bit thinner and different cut. The meal was great and I would recommend the restaurant to anyone who is looking for a quality burger. If you’re looking for something cheap and fast, I would suggest heading to McDonalds. But if you want to enjoy a meal that will fill your belly in Wears Valley, Bear Camp Grill is the place. Next time I will go for their “Prime Time�? Sandwich which is a charbroiled rib eye steak sandwich served on a hoagie bun with some of those yummie steak fries. We do have a great selection of information on the Smoky Mountain Mall site about Cherokee Indian History. We try to add new information all the time. Today we were given a tidbit of personal information about one of the Cherokee. The message is from a side you rarely get in a book. There is no reason why I would be ashamed of my heritage, so I thought I would comment on your pages about the Cherokee Indians. I am proud that I am part Cherokee and am very interested in the heritage and all the Cherokee history. The older I get it seems the more important the Cherokee Indian history becomes to me. I've never told much of my story about my grandmother being mistreated, but I have mentioned too many that a big part of me is Cherokee! Very interesting site to read containing important information about the mistreatment of our Cherokee brothers and sisters. My mother's father's mother was full blooded Cherokee, but I can't prove it. He was a renegade and left home at a very young age and somehow ended up in Sylacauga, Alabama and married my grandmother, Emma. He mistreated her, and after 10 girls and one boy, the towns men kick him out of town. As I called him "Pop," he later moved in with us for a short period after mom married my dad. I was about 2 years old (around 1950) at the time and my sister was 5 years older. We lived in Childersburg, Alabama. He was a alcoholic at the time and later had to leave. When I was older we had been to see him in a low income housing development in Sylacauga, Alabama, and I remember him very well. He was tall and had very very high cheek bones. He had a big laugh and was fun to be around. He had always loved me very much and spoiled me. He said I was just like my mama and she was his pick out of the 10 girls and 1 boy. We lived in Birmingham, Alabama at that time. When he was dying in the hospital (around 1958,) in Sylacauga, he continued to call for mama. He had five daughters who lived in town and we lived 50 miles away in Birmingham but he wanted my mama. She went to him and stayed night and day in the hospital, alone, for weeks until he went on to live with Jesus. I have always wanted to find out more about the Cherokee tribe and maybe learn something about my relatives, but to no avail have hit a brick wall every way I went. His name was Clarence Wood. I don't know how he got Wood unless his dad was a Wood. Thanks for posting such important information for those of us wanted to read about how the Cherokee Indians lived and had to survive after the people from other countries came and took our land. At the time it was the illegal aliens who took the land from us. We fought to protect our rights, our freedom and our land but to no avail it was a useless battle against the incoming settlers. It's that time of year again for Christmas parades, Christmas festivals and other Christmas events in Gatlinburg and Pigeon Forge Tn. Of course there will be a new years eve party and ball drop in downtown Gatlinburg. There are going to be many thousands of people but the fireworks show is well worth bustling through the crowds. The event is free. Saturday Dec 31st is the celebration and fireworks show in downtown Gatlinburg. I had my first taste of snow this fall season in the Smoky Mountains. 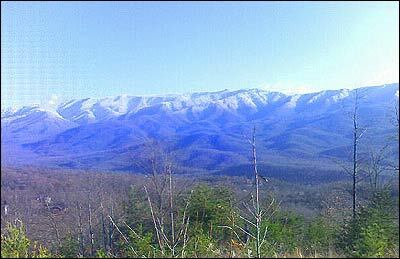 Have a look at a picture of Mt Leconte today. It snowed in the mountains yesterday, but I didn’t want to drive the slick roads up the mountain in my four door coupe. If I had a hummer or some other 4 wheel drive vehicle or snow tires, Id do it. Actually, the snow wasn’t that bad on the roads. I’m just a pansy. Don’t tell. Brrrr it was cold. See, I told you I was a pansy. Besides the 40 degree weather it was a beautiful day in Gatlinburg. You can see the snow capped mountain scenery taken today. If you look in the distance you can see some smoky mountain cabins. As I drove back down the mountain you could see some of the Gatlinburg cabins with snow still melting off the roof. During this time of the season in the Smoky Mountains you can also see many more cabins in the mountains because there are no longer leaves hiding some of them. Hopefully you were able to see the season change or fall foliage in one form or another. We have had a few request for next years dates for the Gatlinburg Chili Cook off and Rib Fest. You heard it here first! Last time I checked its becoming a paperless world. I don't carry much cash anymore to Gatlinburg or the Smoky Mountains myself. I rarely do. Twice in two days I have not been able to make a purchase (both in Gatlinburg), because I did not have cash. The first time I was at a convenience store on the Parkway. As a side note, isn’t convenience really supposed to mean convenience? Ha ha reminds me of Ken Joe Markets and the running Indians. If you live in Tennessee or the Smoky Mountain Area you can probably heard their ad "convenience, not inconvenience�? If you are inconvenienced at KenjoMarkets they give you a free cup of coffee or soda of your choice. I once didn’t get a receipt printed for gas and they gave me a free soda for being inconvenienced. I had just come down from a long day in the mountains in Gatlinburg and I really needed a drink. I must have been without food or water for about six hours. Poor planning on my part I know. I went into the store on Parkway in Gatlinburg and found a bottle of sweet tea to purchase. They would not sell it to me, because I had to spend more than 10 dollars using my debit/credit card. They did mention that they had an ATM that costs 3 dollars to withdrawal cash. Ugh. I left and went to a shop that was literally 30 feet away from this shop. They took my check card no problem. Get this. The previous shop in Gatlinburg was selling me a 12 oz tea for $1.89. It would have cost the store 3 percent plus 25 cents or so to use my card and they would have made at least 50 cents profit. Why turn that down and give it to your competition. I know it’s not a lot but I have a better example. I am now addicted to fresh taffy from the smoky mountains. I went into a candy shop, again on the Parkway in Gatlinburg to buy some candy. I was in the shop looking around for a good 15 to 20 minutes. I was going to buy some peanut brittle, taffy, and some home made Gatlinburg chocolates. I think My purchase was about 21 dollars. I handed them my debit card and they would not accept it because they do not take cards. Ok in this example there is no 50 cent profit. It’s more like 10 to 15 dollars profit. If you are a shop owner in the Smoky Mountains, let me ask you this. Why turn that down? Pay your 3 percent plus the one time credit card run and stop losing customers to other shops. Let me guess, those that don’t use their credit card machine in their business still think you can post date a check and send it through your bank without it being cashed till the past date. Now there are some acceptations to the rule. If you have a Gatlinburg Restaurant or Shop in Pigeon Forge with a high amount of traffic it doesn’t really matter if you have a card machine or not. Regardless, conform to the new standards. Allow people to use cards and you will bring in more business. Ok so cabins in wears valley outnumber restaurants in wears valley. I went to meet with a Wears Valley real estate company, and I had to starve on the way there and on the way back. Can anyone recommend a good restaurant there? Or should I eat before leaving Townsend and Maryville Tn to go into Wears Valley Tn? Or Do I just eat in Pigeon Forge before I turn onto Wears Valley road. I think I am going to start writing about restaurants in the area and about smoky mountain restaurants. If anyone has any comments on a restaurant please let me know. Hello. I did some research for a hourse riding camp in the smoky mountains. I have not been to any myself, but I would love to go one day. When I do, I'll post a blog about it. All of the smoky mountain park’s horse camps are with the nationwide National Park Reservation Service (NPRS). Advance reservations are definately required by calling 1-800-365-2267 between 10:00am and 10:00pm Please keep your reservation number handy you will need it once you get to the horse camp. First-come, first serve. This campground has 27 sites and sits at elevation 2,610 feet. Can accommodate RVs up to 31 feet in length. Campground has running water and bathroom facilities, but NO electric hookups or shower facilities. $17 each night. Group camping is also available. Reservations can be made either on line or by calling 1-800-365-CAMP. The Cataloochee Horse Camp is a separate facility. Please see the "Horse Camp" listing below for additional information. There are five drive-in horse camps in the park. They are located at Anthony Creek, Big Creek, Cataloochee, Roundbottom, and Towstring. All five horse camps can be reserved through the National Park Reservation Service by calling 1-800-365-2267. Reservations may be made up to five months in advance of your trip. Reservations are by site, with each site accommodating up to six people and four horses. Each site costs $20.00 per night, except Big Creek, which costs $25.00 per night.